5 Days Juicing Weight Loss Plan for an Average Person #infographic ~ Visualistan '+g+"
If you are looking for a way to lose extra weight without inserting unwanted chemicals into your system, fresh juicing might be the solution for you. Fresh organic juices are very nutritious and can provide your body with enormous amounts of valuable vitamins and minerals. 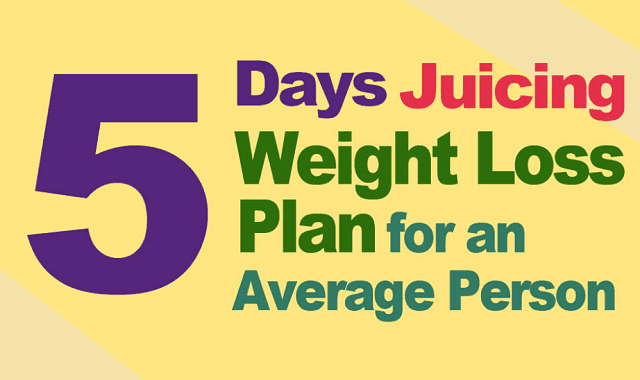 The following infographic introduces a 5 days juicing weight loss plan. Follow the recipes on this plan and prepare different juices for 5 meals each day. This juicing weight loss plan is aimed at average person, it is not a juicing fast. This weight loss plan assumes you will eat low fat proteins together with drinking fresh juices to fulfill your nutritious needs.